VF Corporation, with well known brands in its stable like The North Face®, Vans®, Timberland®, Wrangler®, Lee® and Nautica® , is a global leader in the design, manufacture, marketing and distribution of branded lifestyle apparel, footwear and accessories. The company’s highly diversified portfolio of 30 powerful brands spans numerous geographies, product categories, consumer demographics and sales channels. Denim and Jeanswear is one of the key segments where VF brands has a powerful presence. A study of VF’s financials gives an idea of the direction company is taking and some idea on how consumers are reacting to its various segment offerings. 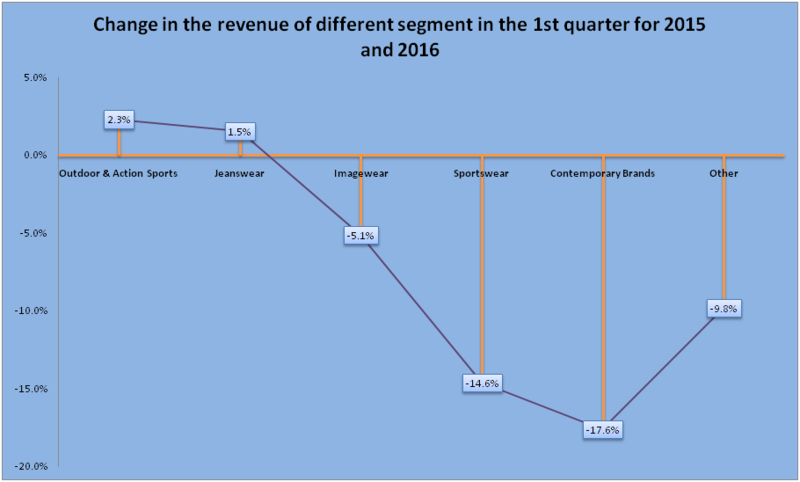 In this report we have done a detailed analysis as well as comparative analysis between the 1st Quarter 2016 and the same quarter in the last year. In the 1st Quarter of 2016, VF Corporation’s total revenue is US $2839.3 million, out of which Jeanswear was $710.6 million which is 25 %(approx) share of total revenue. 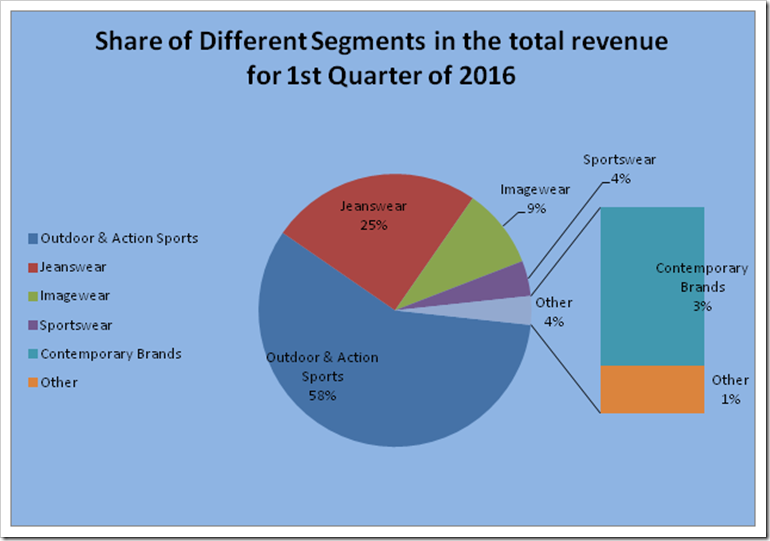 The share of Jeanswear has risen marginally by 1.5% while Outdoor & Action Sports has taken a jump of about 2% in sales. 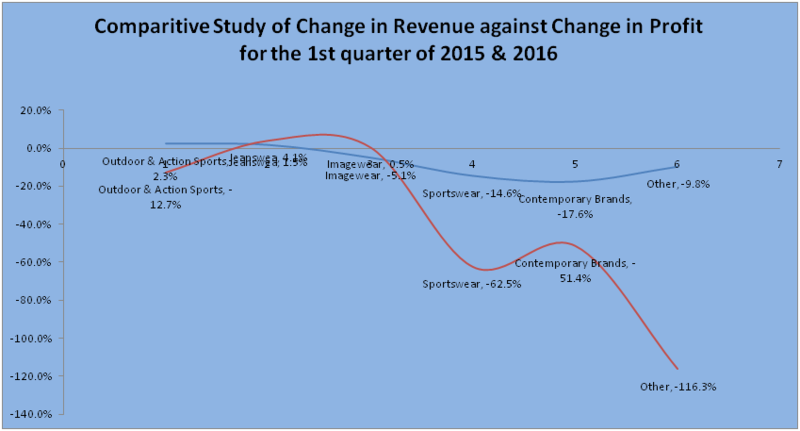 This is not surprising as Activewear is the current flavour of the consumers and VF, like many other brands, is trying to struggle to keep their denim sales to the same levels. 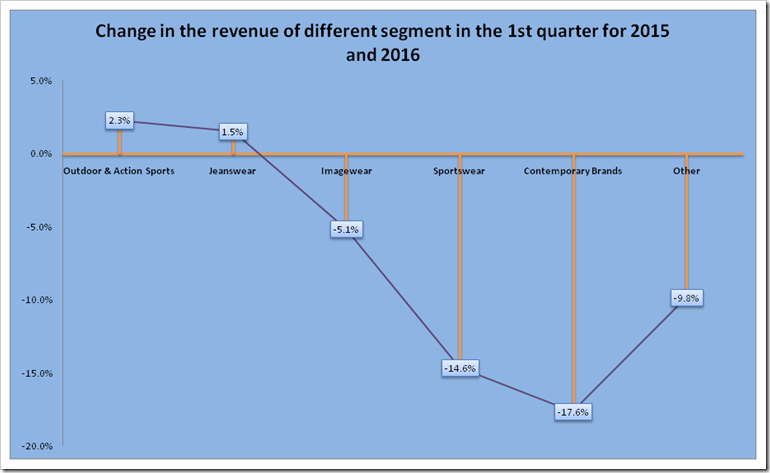 If we look at the revenue distribution of Sportswear , there is a fall of 14.6% from the same quarter of last year . Except Outdoor Sports and Jeanswear , rest of the segments registered a fall in the revenue. 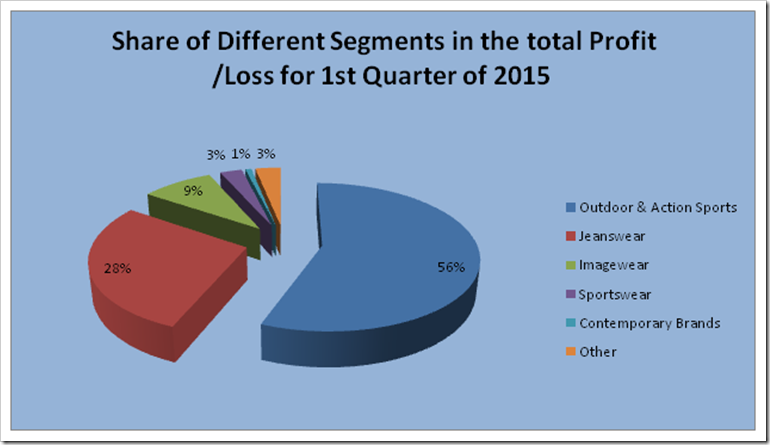 If we look at the profit sharing of different segments ,there is marginal increase in the Jeanswear by 4.1 % from the Q1 of last year ,however the Sportswear segment reduced substantially by 62.5% . 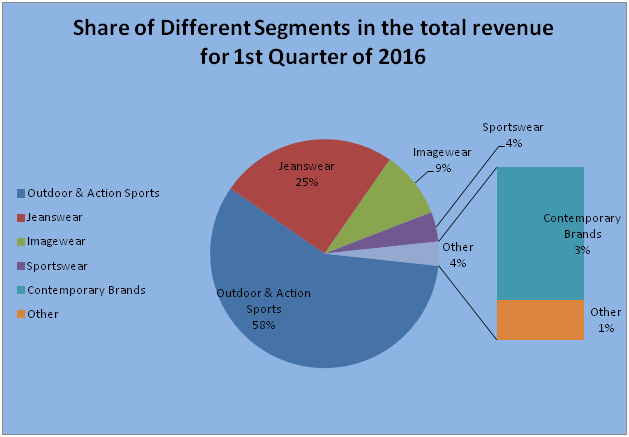 There is a fall of 1 percent in the share of total revenue of Outdoor and Action Sports segment. 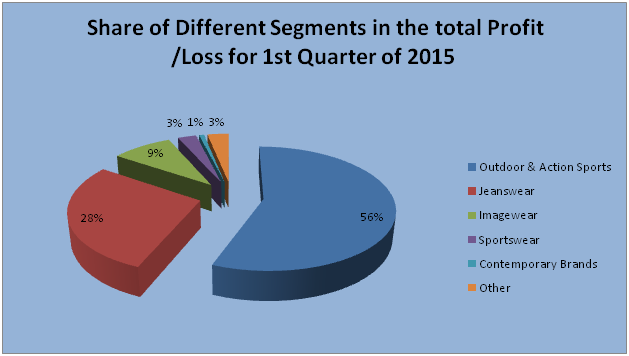 In the Q1 2015 ,the share was 56% however in Q1 2016, it reduced to 55%. The Jeanswear segment raised and increased its share in total profit by 5 % . In Q1 2015 it used to 28% while in Q1 2016 it reached to 33% which clearly shows how important this segment is getting to be for VF. 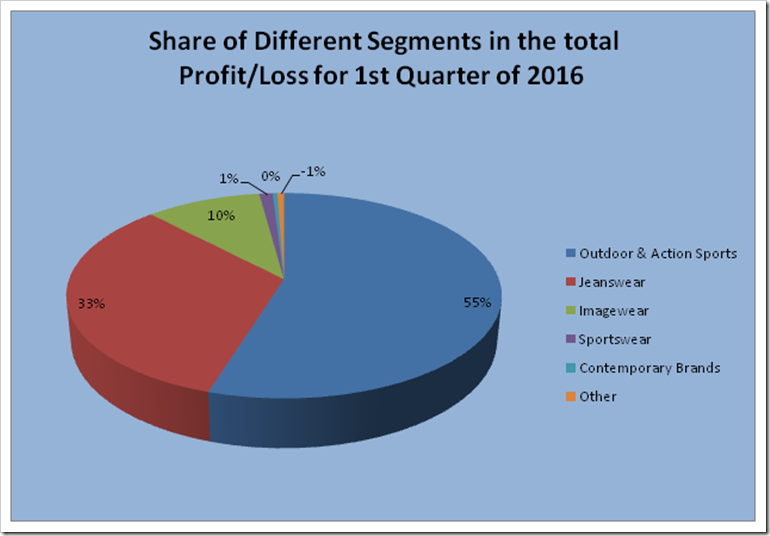 And not only VF, it is true for many other brands who have a diversified portfolio.If we analyze the profit sharing from comparative prospective , we found that the there is a downfall in the profit by 12.7% of Outdoor and Action Sports Segment . 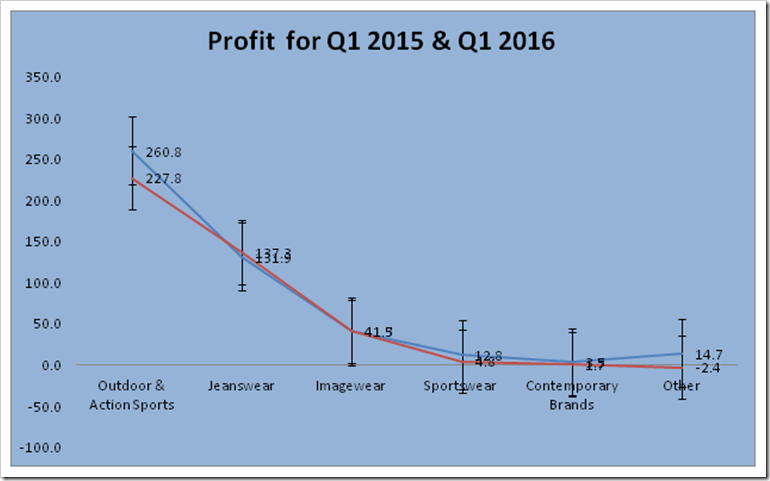 In Q1 2015 , the profit was $260.8 million while in Q1 2016 it is only $ 227.8 million. Even in the case of Sportswear , the fall is of 62.5% which is huge . 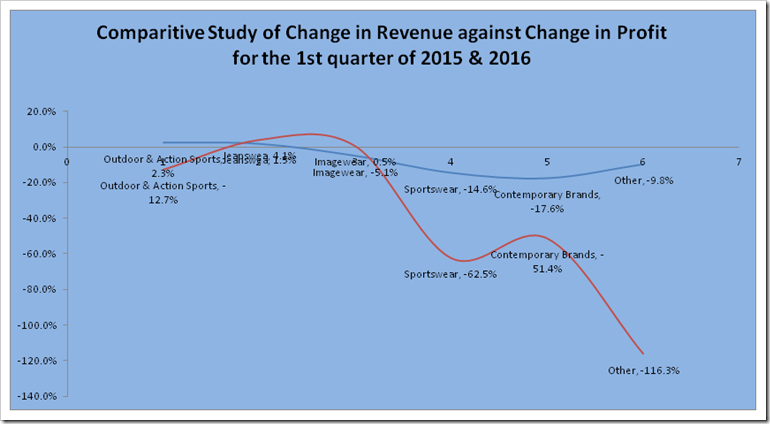 Looking at the change in the revenue against the changes in profit in the Q1 of 2015 and 2016, we found that only Jeanswear is sole segment in which growth in profit is more than growth in revenue. The revenue increased by 1.5% while the profit margin increased by 4.1%. 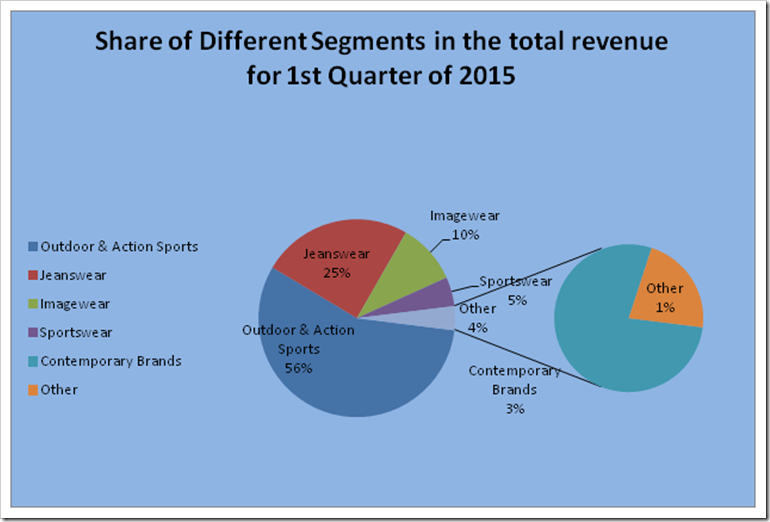 Rest of the segments are showing decrease either in revenue or profit or in both. The story is not much different when we consider the contribution of different segments to the profit margin. 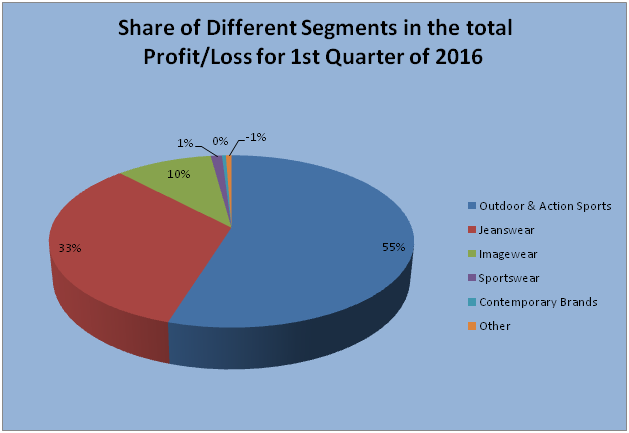 Though the absolute contribution of the Outdoor segment was expected to be the highest, the % share also increased in this case while all other segments reported reduced profits . 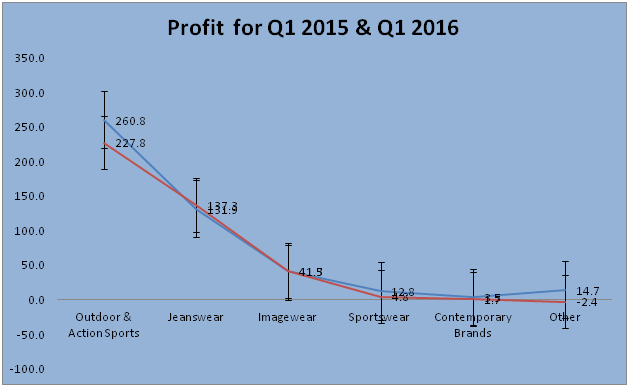 Jeanswear’s contribution to the profitability has been increased . On the whole, VF is increasingly becoming a corporation getting its maximum turnover and profits from Activewear as well as Jeanswear segment and looks increasingly focused in this area as more and more energies of the organization get diverted to this high return segment.